On April 8, 2017, SAADA hosted Where We Belong: Artists in the Archive, a day-long symposium in Philadelphia bringing together artists, activists, academics, and archivists to explore ways to challenge the systematic erasure of stories of marginalized communities in America. Five artists, including Zain Alam, premiered prototypes of new works inspired by overlooked histories of South Asians in the US. Learn more. The first time I listened to Humeysha I didn’t know what to expect. I was vaguely familiar with their existence, but not fully aware of their musical creations. The first song on the LP link was “For Love, From The Law” and after repeating the album through a few times, I couldn’t stop humming the tune of that one song in particular. It felt familiar, like a dream. I played it for my parents on my dingy MacBook air, wishing its speakers were louder, and then my sister in her Audi as we careened through the foliage-heavy Sydney city streets. I sent it to my good friend Durga, also a Bengali writer, wanting to share this feeling I had of finding a shared history. One that is characterized by likeness, of finding your reflection in something and feeling fully self-actualized for a sweet turmeric scented moment. There’s something deeply, holistically healing that I, a predominantly (western born and raised) Bengali writer, interview a Pakistani-American musician, Zain Alam (the lead singer of Humeysha) about identity, displacement but more importantly—art. For me, it’s important for us to dictate our own narratives, to talk about how to deal with our separate histories in a collective manner, acknowledging how our struggles have spilled into each other’s demoralized cultural legacies. How each of our lineages were compromised by our neighbors who conquered us, but that we have the ability to gain from that pain, and the ability to forgive and move forward, collectively. I felt that as I read Zain talk about meeting a man in India who admitted to killing an entire Muslim family, only to later find out that Zain, himself, was Muslim. As I read that answer, I was struck with the extreme emotionality of our heritages, despite me being Bengali, and Zain being Pakistani. I felt for the heritage of Muslims in the larger India, post partition, and understood, again and again, how much we still have to unlearn. But Zain’s answer was perfect, he would not characterize this man by an action of hate he committed decades ago. I, however, am not as generous as Zain, but understand that these conversations need to be had. I defer, then, to a lyric from the song "A Passage to America,"
Zain, as a person who speaks Bengali, but not really Hindi or Urdu, can you explain the genesis of the name Humesyha? I believe it means “always”—so why use that as a title for your band? I chose the name Humeysha for a very simple reason—it’s been my favorite word in Hindi/Urdu since I was a child. I loved it for its sound and even more when I discovered that it’s also a Persian word with the same meanings of something perpetual and lasting, forever and always. I felt that all of its associations with time and loss were rather appropriate for a project that began while I was recovering family narratives in India before they were lost to history. 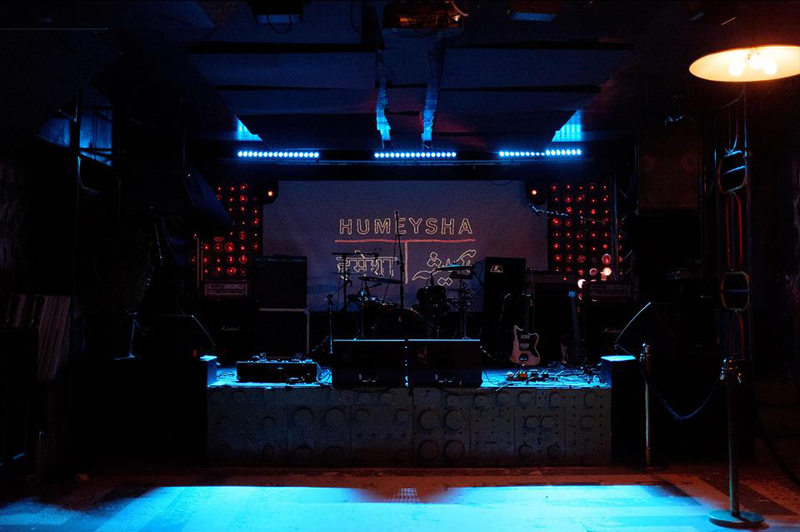 What was the conception of the band Humeysha? The band came together after the release of the LP in 2015 so the songs could be performed live. My best friend (and producer/guitarist on the LP) Dylan Bostick and I had been re-recording and mixing the songs I had written a year before in India, and nothing could stop the songs once they began to take form. The melodies were inspired by Bollywood tunes I’d strum out on my guitar after hearing them in street-side dhabas and remembering my childhood in Georgia. Sitting at a dargah in Delhi listening to a qawwali repeat and build in intensity influenced my experiments with loops of found sounds. 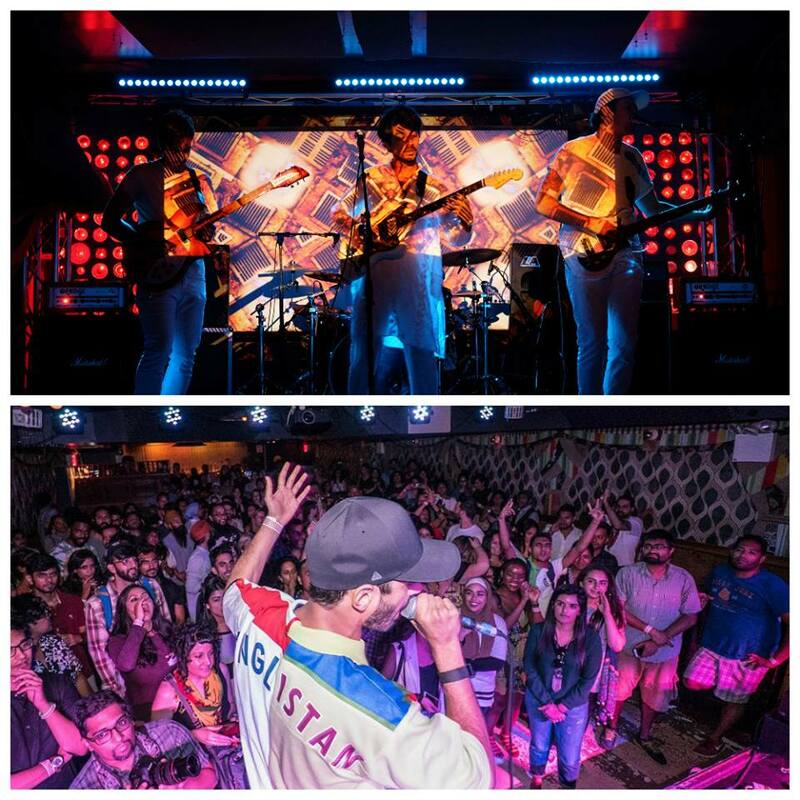 My musical bearings are mostly self-taught and refined through playing in bands in college (where I first met my bandmates), but the aesthetic glue for Humeysha came through everything I absorbed in India. Besides Qawwali, which is super present throughout the LP, what are your other influences, musically? Bollywood is the other big influence. I’ll listen to most songs with Asha Bhosle or Lata Mangeshkar on it— always been a big sucker for their syrupy-sweet melodies. And the composers they worked with are cornerstones of my childhood. I didn’t listen to much classical Hindustani music until I got to college but then fell in love with it. My mentor in Lucknow Saleem Kidwai gifted me an enormous collection of classical musicians that I came back to over and over again while writing the LP: Girija Devi, Bismillah Khan, and Begum Akhtar, to name a few. Even beyond their music I’ve always been struck by the incredible cosmopolitan lives these artists led in India, far ahead of their time. Post-rock was one of the first genres of guitar music I really fell in love with since a lot of my favorite music when I was younger was instrumental. My favorites from then (like Godspeed! You Black Emperor) remain favorites now and explain my obsession with shoegaze, drone, and ambient music. Brian Eno is another big influence given how he’s been able to straddle between genres to make a sound distinctly his own. I could listen to his ambient works on loop for a very long time, as well as others he’s inspired, like Stars of the Lid and William Basinski. There’s something to that feeling of floating and weightlessness in their music that I find irresistible. Hip-hop artists might not be as obvious of an influence, but it’s everywhere in the LP. Their approach to sampling and looping as a way of refashioning the past into something fresh of your own is the quintessential story of creativity. I could go on and on about how much I enjoy Southern giants like Outkast, early Three 6 Mafia, and Gucci Mane. I’m not sure you can grow up in Georgia without memories of speeding down I-75 late at night listening to them at full volume like you’re invincible. When I have to write something, say for example an essay that I’m super invested in, or when I was editing my novel, I read a lot. Especially those who inspire me. I re-read a lot of Clarice Lispector, Susan Sontag, Zadie Smith, Jhumpa Lahiri—also my number one go to: James Baldwin. How do you write your music? Is there anyone you turn to again-and-again? Inspiration can come to me just as easily from literature and philosophy as it does from music. Reading Heidegger’s “Being and Time” in an undergraduate seminar, for example, was a big catalyst for imagining how I could piece together a coherent sound from the various musical traditions I’d grown up with. Last semester, I’d often run home from the library to record a melodic idea that struck after reading something poetic in classic works of Islamic philosophy by thinkers like Al-Farabi or Suhrawardi. As dry as those essays may appear at first, there’s something elegant to their skeletal simplicity touching on topics like God and imagination, where you find yourself pouring over what they’ve said until it’s burrowed its way deep into your subconscious. We’re both Muslims. For me, Islam bleeds into everything that I do. I am unbelievably attached to Islam, which I think is quite interesting for people (who don’t know me) to comprehend. I’m tattooed all over, I don’t dress particularly Muslim (though I resent even stating that, I know others would surmise that) yet Islam is arguably a third character/component in a lot of my writing, as well as a source of great relief in my personal life. What’s your relationship to Islam, and how does it transmute (if at all) into your music? The Pakistani historian Ayesha Jalal gave a lecture whose title “Islam is the Ocean” resonates a lot with me and reminds me of how Islam bleeds into everything for you. In some ways I’m not sure “religion” alone is an adequate way to describe Islam for people like us. It’s not just a set of rituals we occasionally come back to. It’s a whole ocean of culture, philosophy, and history that we can dive into and draw from to best serve us in our world. There’s so much in there that’s given rise to beauty and brilliance in the Islamic world. And it still can. I think it’s most productive to talk about how it’s on Muslims like us— especially artists, writers, and intellectuals—to make our own way in the world. I could spend hours getting into the nitty-gritty of all I deeply care for in Islam, but at a high-level, I’ve always been deeply attracted to its singular sense of discipline and devotion to justice. Even in my adolescent days this attraction manifested itself in studying the Qur’an and researching commentaries, in addition to praying five times a day, fasting during Ramadan, and always asking questions in Sunday school. I couldn’t figure out what the point of being a Muslim was if I wasn’t 110% committed to it. I think that’s exactly what Muslims like you and I aspire toward when we engage deeply with Islamic tradition, wrestling with how to bring it alive in the context of our own lives. Absolutely, that quote is incredible. Ok, moving on—how do you self-identify? I was interviewed by the BBC Asian Network last year and the interviewer asked me what I was (ethnically) and I just said Muslim. As I am a scattered amalgam of many things, I feel uncomfortable saying just one thing; (though, these days I’m like: is it just easier to call myself Bengali?) it never feels right. It also feels like I’m making my identity digestible to others. If anything, I feel culturally South Asian. Do you feel the same, or do you feel tied to a Pakistani heritage? This gets right at the root of why I went to India in the first place: the shock of discovering from my grandfather that all of my grandparents were born and raised in India. Talking to them further I became enchanted with how much they missed their ancestral homeland and regretted what happened in 1947, unlike the lazy enmity other Pakistanis harbor for India. 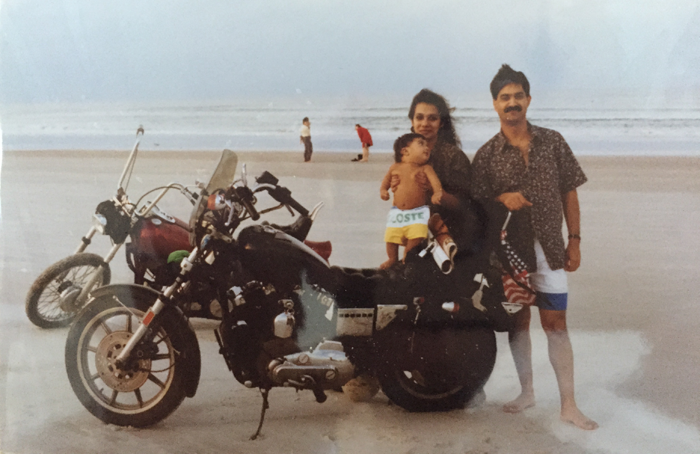 I’m not uncomfortable with saying I’m either of Pakistani or Indian-origin these days; my parents were raised in Peshawar and Karachi, but I’ve lived longer with friends and family in India. I can’t simply discount them and my ancestry there for political reasons. It’s just not true. In that respect, I agree with you: South Asian can feel like a more inclusive and accurate way to describe ourselves. If anything, the subcontinent is one of the best case studies in how people can count a dizzying array of multiple belongings hard to imagine in the West. I also call myself a Muslim, but like you said, saying just one thing never feels right. The Islam shared between a Muslim in India and a Muslim in Egypt should be celebrated, but so too should the gulf of differences between them. Add to my scattered identity the fact that I was born in Queens and raised outside of Atlanta, Georgia. I’m not sure I’d ever describe myself as a Southerner, but I can’t escape the two decades I spent growing up there either. That’s what so crazy about identity! 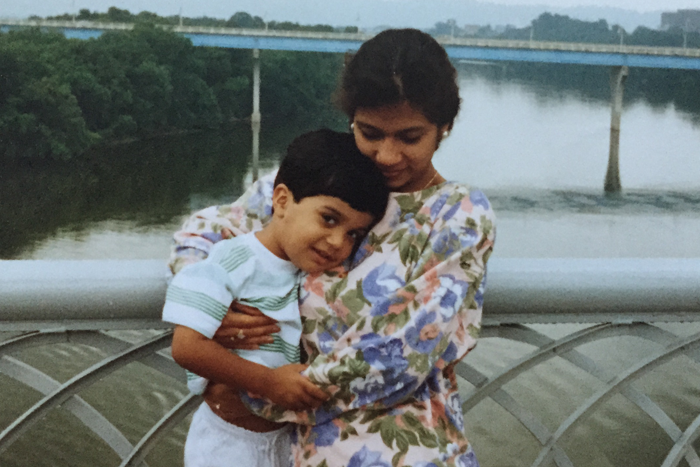 So, how do you navigate and negotiate your creative identity as a South Asian? Do you draw from the history of incredible art from our collective lands, like Rabindranath Tagore, Amrita Sher-Gil, Arundhati Roy, Nusrat Fateh Ali Khan… or are you just trying to create in isolation, without certain influencers as landmarks? There’s long stretches of time where I’ll find myself almost exclusively listening to music or reading poetry from South Asia, partially due to my studies and partially due to my own nostalgia for the time I spent living there. There’s nothing better than the inspiration that comes from going down the rabbit hole of classics and influences I was once ashamed of. Someone like Begum Akhtar is a big inspiration, given the monumental body of work she was able to achieve despite the time and place she lived in. It’s important for South Asian artists like us to acknowledge the unfortunate parts of our culture and history as well as the incredible traditions behind us, especially when they’ve given rise to artists who are, say, female or Muslim, in a world that otherwise had (and has) little place for them. There’s more freedom to be gained in engaging with the past rather than trying your hardest to pretend it’s not there. It bothers me when artists coming from a dominant white male paradigm elevate their work as pure and untouched by “lower” concerns of identity, heritage, and tradition that the rest of us are “stuck” with. No, you’re drawing from those sources as well— yours have just been given the veneer of classicism and abstraction excluded from the rest of us. This all kind of gets back to why I feel a very deep affinity to hip-hop. To have spun something so fresh and radical using the bare minimum of tools available to you, looping samples of songs from the past, that would go on to influence music around the world— that’s what it’s all about. As a kind of non-sequitur, but still in the realm of identity, I have to ask, how do your parents feel about your music career? I mean, I still have to defend my “writer’s life” to my parent’s, even after all my supposed “successes.” I must say it’s tiresome. I think they weren’t too concerned since they thought it was mostly a hobby playing guitar at home and even when I played in college. They (along with my friends) didn’t know I was writing songs while on the fellowship in India. When I began telling my parents I was working on music in the studio every weekend, they couldn’t figure out what I was working on. I played them some of the first demos when I came back home for the holidays. It was only then that it dawned on them that I wanted to take this seriously. I’m still not sure if they completely “get it” per se, but they’ve taken it seriously ever since. They’re very supportive now and I feel lucky to have their enthusiasm, knowing how sensitive South Asian parents are to their children pursuing “useless” things like the arts or humanities. Luckily, I’ve also always had academic work in Islamic and South Asian studies to complement my music, though I suppose academia too is somewhat “useless” by our community’s measure. When people hear about these two pursuits they always ask me (or my parents): so what exactly do you do with that? As if creativity is not a calling! I can’t put all the blame on that older generation of immigrants who’ve had to deal with immense economic pressures, but look—we’re here now. We belong to this place and are just as much a part of it as anyone else. So it’s just as (now if not more) important that we encourage our youth to go into arts and the media just as we do medicine or engineering. Growing up, being Muslim trumped everything. I mean, of course after 9/11, but even before then I always felt different being Muslim. I was recently reading an essay, in a book dedicated to John Berger, where Indian photographer, Ram Rahman, talked about Narendra Modi’s (the current prime minister of India) “involvement” in the Gujrati massacre of Muslims in 2002. Reading it just made me realize like—(low and behold) wow, historically, people hate Muslims! Similarly, I did a performance last year where Himanshu Suri also performed. His performance was specifically about the Islamophobia that exists in brown non-Muslim communities, and the importance of coming together. It brought me to tears, it felt like a weird release. I feel like that aspect of decolonization isn’t readily talked about. So, is that something you feel you’re navigating at all in your music, this aspect of a larger South Asian identity, that makes room for Islam? Because I think so many of the reasons that we feel displaced as an entity is because we can’t come together. Absolutely. I felt similarly about always being othered as a Muslim— the kid who didn’t participate in prayers before or after soccer games, cried after eating pepperoni and discovering it was haraam, and refused to admit that Jesus was God to questioning friends. Growing up in Kennesaw, GA after 9/11 gave me some real insight on how little people knew about us and were willing to make quick associations from what they saw on TV: from 9/11 to Bin Laden to Muslims to bombs. Despite (or perhaps because of) growing up as a Pakistani Muslim in the South after 9/11, I’ve tried hard to remain steadfast in my assumption of people’s fundamental goodness, even after this past year. To essentialize the conservatives I grew up with as greedy and hateful falls into the same dynamic that we minorities complain about of white supremacy directed against us through racism and xenophobia. Cosmopolitan societies prove that bridges can be built across difference, because some similarities in here in all of us as humans: the desire to love, feel safe, leave the world a better place. We need to find new ways of allyship, as well as respect for one another’s differences. I’ve also performed with Hima and appreciate what he’s been doing (along with Riz in Swet Shop Boys) as part of a greater movement to come to terms with the experiences we share across the South Asian diaspora. I’m not going to come together with someone only for the color of their skin, but if we both strive to combat Islamophobia after a humiliating experience at the airport because of our color, yes-- let’s link arms and fight. In an interview with The Aerogram you mentioned you were a story scholar for the 1947 Partition Archive. What were some strange/cool/fascinating things that you learnt from there? There are too many incredible stories from the 150+ elders I interviewed back then. One surprising self-discovery was how I could earn the trust of elderly Indians—whether Hindu or Sikh, from the north or south—despite not having ever lived in India. Over a cup of chai I could narrate to them discovering my own Indian ancestry and the American experience of diaspora in a way that put them at ease, ready to open up and share their own stories. Convincing strangers in a foreign country to share tragic (and sometimes triumphant) stories from more than six decades ago was not an easy task. But in time, I could even navigate my way through the most difficult of interviews. A man who had confessed to killing a whole family of Muslims in 1947 was shocked to later realize my Muslim background. I assured him that I had no reason to be angry for what he did more than six decades ago. My hopes and goals in talking to people like him, I explained, were solely to ensure that their stories would survive for generations to come. I feel similarly about my creative work drawing inspiration from the South Asian artists and traditions that came before us. They deserve to be reimagined today as sources for thinking about the world differently and seeing one another more compassionately. What does it mean to you to be a South Asian creative? Do you consider it a feat? I did not choose to be born South Asian, but as a creative it would be an enormous waste to simply ignore the rich heritage I grew up with. There’s a certain degree of lived experience that is unique and informs my creativity. My ethnicity is important, but even more important is what I do with it. I think too many conversations about cultural appropriation at the surface level tend to miss the importance of investment and respect as part of creativity. Part of that respect also requires being aware of histories of racial supremacy, colonialism, and disempowerment. But I’m not one for putting up walls where someone has enthusiasm and decades behind them for the hard work ahead of us. I do see creativity as a feat considering how little encouragement South Asians get and the lack of support systems there are for us growing up. I would’ve laughed had you told me ten years ago I would put out a record. It just always seemed very unlikely, having learned music independently and never seen a single South Asian role model in America do the same. Things seem to be changing for the better these days though. The progress is still slow, and we’re still having to fight to negotiate to do work on our own terms rather than others. But as long as we keep our heads down and push ourselves to pursue what resonates most, we’ll be on the right path. What is the main thing you’d want anyone to get from Humeysha? That the things you’ve grown up with—especially if foreign or different—are cool and worth sharing with others. As immigrants we’ve inherited so much richness and complexity from our parents and have an incredible opportunity to do something unique with it now in new soil. If the condition of diaspora is to never feel quite at home, I’ve found the answer is the process of creativity: continuously building culture and telling stories that give us a sense of belonging. And to the older generation of parents, elders, mentors—please encourage creativity in your younger ones! There’s nothing quite as disheartening for children to hear elders laugh at their desires to dance or sing or write poetry. Engineering and medicine are great career paths to follow, but not the answer for everyone. Now more than ever, our world—America in particular—need Muslim and South Asian and other underrepresented voices to speak up and share stories so that others can understand that we too are people who belong here. What would advice would you offer a South Asian creative about pursuing their art? Don’t be afraid of drawing on the traditions that you belong to—whether from a faith community, the city you now live in, or where you have origins—as well as those that inspire you. Always be aware of your position and question what it means to engage with another tradition, but don’t preclude yourself from touching on something new for fears of being denounced as “inauthentic.” South Asians are more than just their bhangra and Bollywood. And white people should not be the only ones with the privilege as “expats” to traverse through traditions all around the world and do with them as they feel. Pursuing the art that resonates with you is what matters most. Then consider your family, loved ones, friends, and the communities you belong to, in descending order. Everyone else can join in and enjoy in what you’re doing, but know that they’re not the priority. It’s most important that you are proud of what you have made, though it’s also lovely when you find your Mum humming a melody you wrote, over and over again. 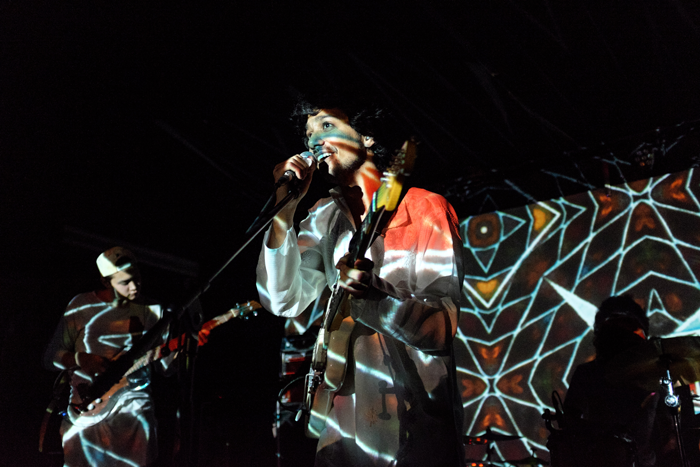 Live concert photographs credit: Ilana Milner.